At hand is something of a calling card, a selection of compositions for electric guitar that showcase what the guitarist can do in a solo context, who has up until this point always been associated with his band Mastermind. Launching the album of twelve instrumentals with the surf-beat title track, it doesn’t take long to realize this is something entirely new, and not another album by his band. Drummer Jason Gianni (from the Neal Morse band) joins Berends, who plays all other instruments – multiple guitars and bass primarily with an ear toward a strong melodic composition in a variety of rock based styles. If one enjoyed the late-60s work of Eric Clapton, “Heavy Cream” seems to be a tribute to that bluesy rock style. 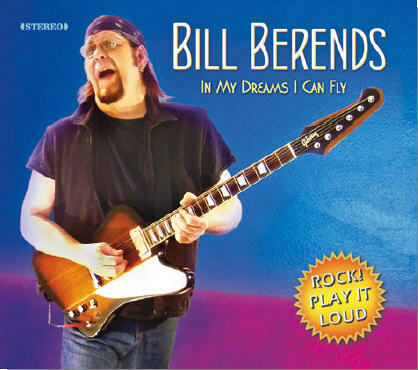 One might also hear stylistic echoes of Jeff Beck, Richie Blackmore’s more melodic side, Ronnie Montrose, Steve Morse, Harvey Mandel, Dickey Betts, and other classic guitar slingers from the past throughout these twelve cuts, but nowhere is any of this derivative, as Berends has a solid command of his compositional chops. After five cuts of pretty much straight-up rock the listener is treated to “In a Quiet Place,” a slower paced, beautiful melodic piece that is one of the album’s standouts. But there are many more standouts throughout this style-shifting smorgasbord of classic rock, every moment of which is thoroughly enjoyable. “The Longest Winter” is not only the disc’s longest track, but a moody, introspective melodic piece that evolves slowly and erupts into a powerful and memorable refrain at several points during its seven minutes and change. All said, this is a set that should please any fan of classic instrumental guitar rock.